35mm format 43MP CCD sensor meets the high resolution and image uniformity requirements of vision based industrial inspection systems. ON Semiconductor is extending the capabilities of critical high resolution industrial imaging with the introduction of a new 43 megapixel (MP) resolution, charge-coupled device (CCD) image sensor in the convenient 35 mm optical format. The KAI-43140 is ideal for use in applications where both very high resolution image capture and excellent image uniformity is required, such as end of line inspection of high-definition (HD) and ultra-high-definition (UHD) flat panel displays and aerial photography. 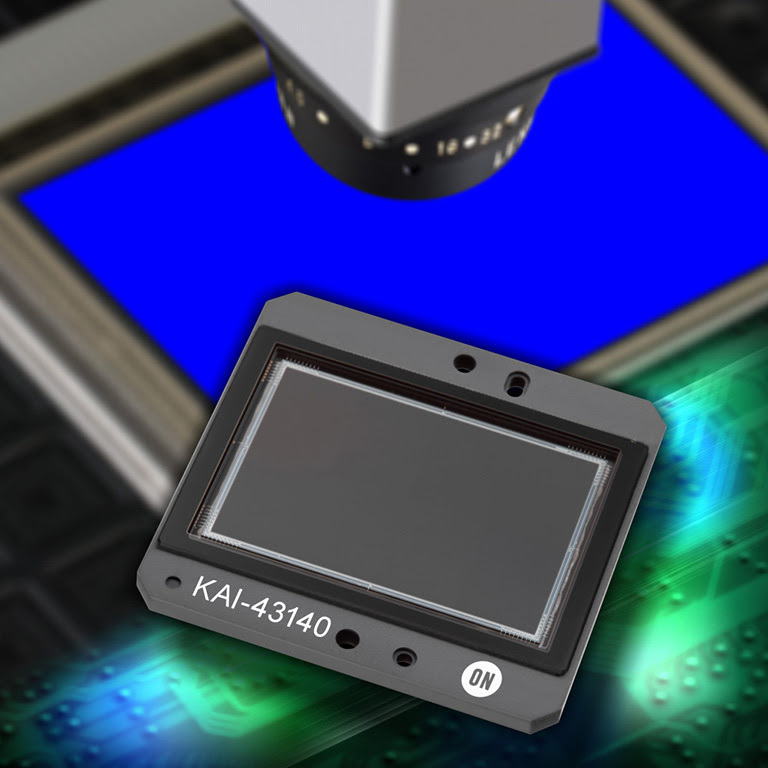 The KAI-43140 utilises a new 4.5 µm Interline Transfer CCD (ITCCD) pixel that increases resolution by 50% compared to the prior 5.5 µm design while preserving critical imaging performance. Featuring a true electric “global” shutter, the device supports full resolution frame rates up to 4 fps through the use of flexible 1, 2, or 4 output readout architecture. The KAI-43140 shares the same package and pin definitions as the popular 29 MP KAI-29050 and KAI-29052 image sensors, allowing it to be incorporated into existing camera designs with only minor electrical changes – speeding time-to-market for adoption of the new device while retaining continuity with existing camera and lens installations. Engineering grade versions of the KAI-43140 are now available, with production versions planned for early 3Q18. The KAI-43140 is available in a ceramic PGA package, and is offered in monochrome, Bayer Colour, and Sparse Colour configurations.